The baseball cap is here to stay. Yahoo recently posted a picture of Scott Patterson on the set of Netflix’s Gilmore Girls revival. 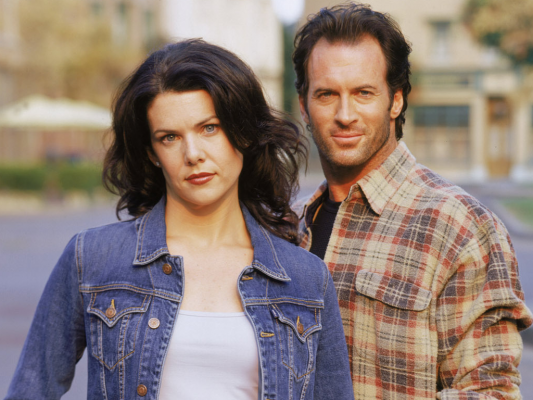 Patterson played Luke Danes, the love interest of Lorelai Gilmore (Lauren Graham), on the original WB/CW series from 2000 to 2007. In the revival, Patterson will reprise his role as Luke alongside fellow cast members Lauren Graham, Alexis Bledel, Kelly Bishop, Keiko Agena, Sean Gunn, Liza Weil, and several others. Recently, it was revealed the reboot will feature creator Amy Sherman-Palladino’s intended last words for the finale. What do you think? Are you a Gilmore Girls fan? Are you glad Luke hasn’t changed that much? Has there been a release date set for sure yet?? I just got done watching years 5 through of 7 of Gilmore Girls on Freeform. 2 episodes a day. Talk about binge watching for me. I hope that they keep the Gilmore Girls going for a couple of more years. It was an interesting series and fun to watch. There were about 50 episodes and watched it for 5 weeks or more at 10 episodes a week. I did watch some of the episodes back in 2005 through 2007, but that was so long ago, that they all seemed new to me. If you get the UP network they also have it on they have at least 3 a day on. Sometimes more.